Powder Handling Isolator are designed to provide a cost-effective, safe handling environment for high potency drugs with an Exposure Control Limit of 5ng/m³. These Isolator are constructed in stainless steel with a hinged glass door for easy and secure access, automatic pressure controle with ramp up facility and interlocking transfer hatch. 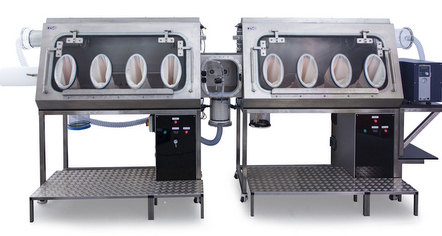 The Powder Handling Isolators provides <5ng/m² for handling of potent drug compounds. Access to the Powder Handling Isolator is controlled via an interlocked transfer chamber ensuring safe sample entry and exit. These custom-built isolators can be fitted with recirculating air extraction with inlet and outlet HEPA filters, N2 purge, O2 analysers, Docked RTP ports etc. The units are CE marked and are available in acrylic or in Stainless Steel with toughened glass viewing windows.